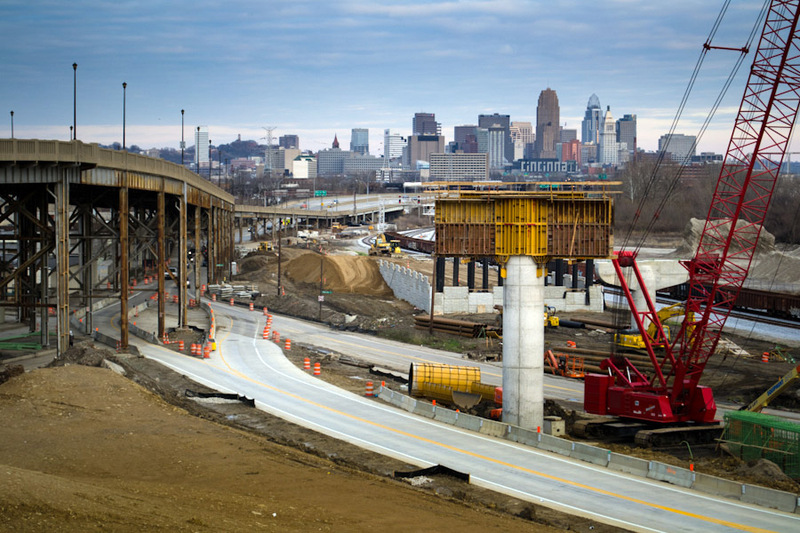 The tentative project list released last week by the Ohio Department of Transportation’s (ODOT) Transportation Review Advisory Committee (TRAC) will delay many major highway construction projects throughout the Cincinnati region. Some of the Cincinnati-area projects to be impacted by ODOT’s budget crisis include the Oasis commuter rail line which had its funding erased, the highway portion of the Eastern Corridor Project which has now been delayed, and start dates on future phases of I-75 reconstruction work have been pushed beyond 2020. 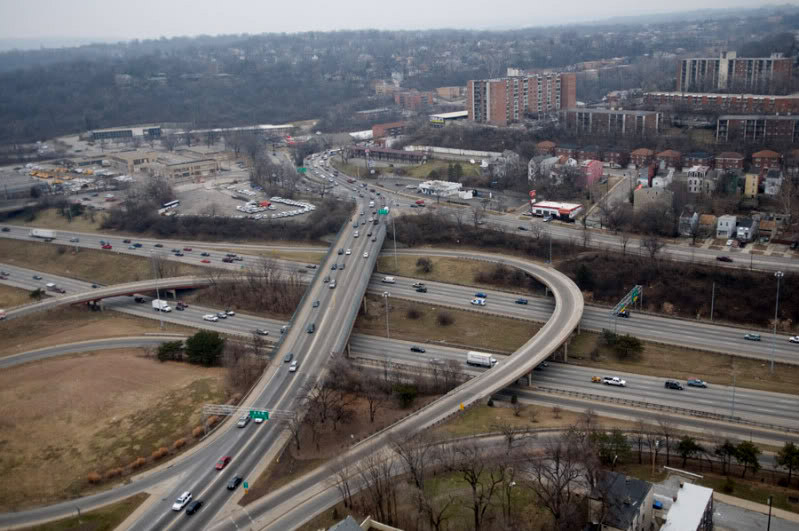 ODOT’s cuts have also affected the City of Cincinnati’s West MLK Drive Access Improvement, since that project was coordinated with phase four of the I-75 Millcreek Expressway project. Some of that prep work has begun with ODOT demolishing the old Interstate Motel and several apartment buildings near McMicken Street in 2011 in preparation for reconstruction of the Hopple Street interchange in 2013. Martin Luther King Drive works its way uptown [LEFT]. An aerial view of the Hopple Street Interchange [RIGHT]. Photographs by Jake Mecklenborg for UrbanCincy. 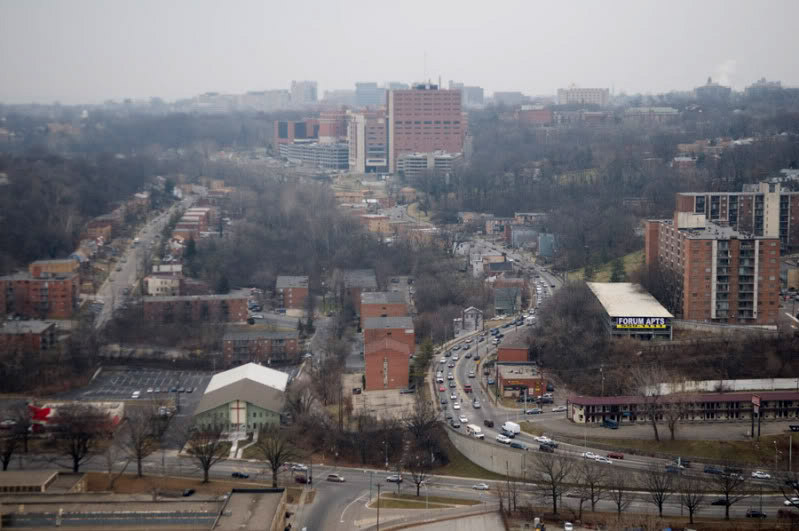 With $109 million in Millcreek Expressway phase four funds now delayed until after 2020, Michael Moore, Director of the Department of Transportation & Engineering (DOTE), told UrbanCincy that the city will continue to proceed with work planned for MLK Drive between Dixmyth Avenue and McMicken Street in 2012. Two miles east of the West MLK Drive Access Improvement, preliminary planning will continue for an interchange between East MLK and I-71. TRAC has programmed $3 million to fund environmental studies, select a preferred alternative, and perform preliminary design work. Construction work progresses on the Waldvogel Viaduct in Lower Price Hill. Photograph by Jake Mecklenborg for UrbanCincy. Elsewhere, phase one reconstruction work on I-75 will continue near Mitchell Avenue, and work on phase three, the reconstruction of the I-74 Beekman/Colerain interchange, has been fully funded and will commence later this year. However, funding for reconstruction of the I-75/I-74 interchange and all work south of that point has been delayed, as has all planned work between the Norwood Lateral and I-275. When asked about the ongoing work on the Waldvogel Viaduct, DOTE’s director informed UrbanCincy that the reconstruction project has been fully funded, and will not be affected by ODOT’s cuts. A second phase of that project, which involves upgrades to the Sixth Street Expressway, has also been fully funded and will proceed as planned. Download a PDF of TRAC’s entire project list.